As Russia’s military escalation in eastern Ukraine continued last week, Vladimir Putin found time to visit the Seliger National Youth Forum, a summer camp for pro-Kremlin young people some two hundred miles northwest of Moscow. Among the many subjects discussed was history: he spoke about the Bolsheviks, the masterminds of the 1917 October revolution and the founders of the Soviet state. To many in Russia, Putin’s interpretation of the revolution would sound odd. He accused the Bolsheviks of treachery because they undermined the country’s military effort against the Germans in the First World War. Russia had entered the conflict as an ally of France and Britain. Three years later, the imperial regime fell, exhausted by the war and undermined by broad public unrest. The country was in disarray; soldiers defected. Several months after the collapse of the Russian empire, the Bolsheviks seized power. Lenin, their leader, who had called for “turning the imperialistic war into a civil one,” withdrew Russia from the alliance and made peace with Germany. His plan was to pitthe disenfranchised (soldiers, peasants, workers) against the nobility and the propertied class, to radically destroy the ancien régime and consolidate Bolshevik power. He launched the Red Terror, a merciless extermination of the Whites, the “hostile classes”; the officers of the imperial Army who had fought against Germany were among the primary targets. After several years of a horrific, fratricidal war, the Reds prevailed, and Lenin became the glorious leader of the world’s first “state of workers and peasants,” as it was known. For more than six decades after his death, in 1924, he was a worshipped founding father, his embalmed body kept on display in the Mausoleum in the Moscow’s Red Square. Cities, streets, industrial plants, collective farms, Naval vessels, universities, and libraries came to bear his name. His slogans, portraits, and statues were everywhere. Generations of Soviet citizens revered his memory, including Vladimir Putin, who was born in 1952. During the years of Mikhail Gorbachev’s perestroika, and the eventual unveiling of the crimes of the Soviet Communism, the figure of Lenin remained untouched long after other Communist heroes had been uncrowned. Even after the Soviet Union fell apart, in 1991, Lenin was not formally denounced. Russia’s first President, Boris Yeltsin, tried to build his regime on anti-Communism, but that effort ended in a spectacular failure. The Communists enjoyed broad public support. When Putin came to power, in 2000, he made peace with the Communists; he expanded his electoral base, reduced theirs, and gently subdued them into loyalty. All through that decade, he preferred to avoid divisive ideological questions. 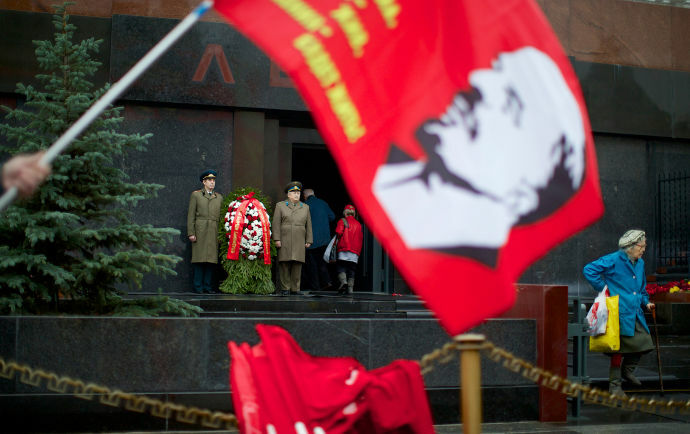 Lenin was not seen as a national hero, and the official discourse was mostly silent about him, but the Mausoleum remained open to visitors, and every Russian city has a Lenin Street or Lenin Square. In Moscow, a gigantic Lenin monument marks the beginning of city’s longest avenue, Leninsky Prospekt. The Communist Party of the Russian Federation, a “systemic” opposition party (that is, opposition only in name), which has a sizable faction in the Duma, regards Lenin as a man of genius, a “great philosopher and economist, a political genius of international renown,” as Vladimir Kashin, the Party’s deputy chairman, put it earlier this year. When Putin returned to the Kremlin, in 2012, he became increasingly ideological. He now professes a state nationalism that draws on a besieged-fortress mentality, a hard-line anti-Western stance, and faux traditionalism. His platform includes a new, uniform concept of history, to be taught in schools. But, his emphasis on ideology notwithstanding, a shared national narrative of the formative event of the twentieth century is still missing: Was the 1917 Bolshevik revolution a national disaster that destroyed the imperial Russian statehood? Or was it the beginning of the Soviet state of which today’s Russia is a successor? In other words, since the Russian civil war did not end in a reconciliation, do we identify with the defeated Whites or with the Reds, led by Lenin, who exterminated them? More than half of the Russian people still view Lenin as a positive figure. Now Putin, with his signature evasiveness—and careful not to mention him by name—has called him a traitor. With streets and statues honoring Lenin all over Russia, Putin’s interpretation hardly contributes to a uniform version of history. I will kill all maoist scumshit I encounter in my long life. Nay, I will BEHEAD them. Well, we aren’t Maoist. More importantly, cowardly lions don’t frighten anyone.